APA realizes the importance of cultivating and inspiring the next generation of leaders and innovators for the organization and the planning field. The Young Planners Group (YPG) plays a critical role in doing this and APA provides support, training, and opportunities for knowledge exchange among YPGs across our chapter. What is the Young Planners Group? YPGs are a community within the APA, which focuses on providing young planners or emerging professionals with guidance, resources, and professional opportunities so that they can excel in their professional careers and become the planning leaders of the future. Young planners are those between the ages of 18 and 35 years old. Why a Young Planners Group in Arizona? We Need Mentors - Join Today! The registration deadline has been extended to November 30. 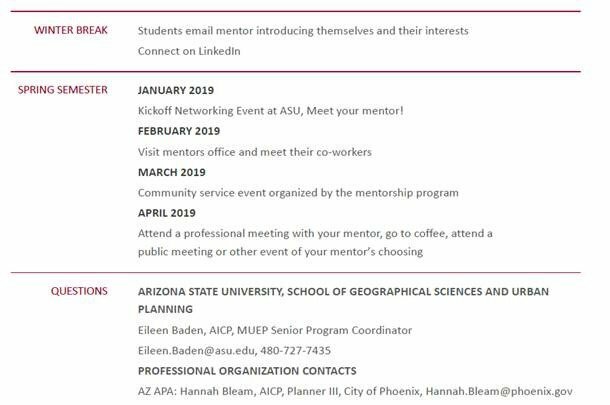 The ASU's School of Geographical Science and Urban Planning and APA Arizona Mentorship Program is back again for another year! The mentorship program is a great way for professional planners to give back and help guide planning students in their future planning careers. Read testimonials here! If you are a professional planner and would like to become a mentor, please contact Hannah Bleam or register HERE. If you are a student and would like to be mentored by a professional planner, please contact Eileen Baden or register HERE.